What Are Military Enlistment and Re-Enlistment Bonuses? 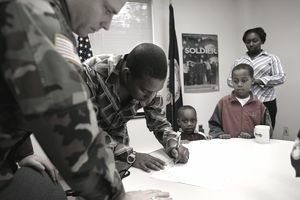 The United States military services use enlistment bonuses to attract recruits into jobs that are experiencing shortages in new recruit volunteers. Generally, these are set-cash amounts in exchange for agreeing to serve for four to six years in a specific military specialty. The Army offers bonuses for some two and three-year enlistments as well. There can be several reasons why the service may have problems attracting new recruits to some military specialties. Two of the most common is that the job has very high qualification standards and/or the job simply doesn't sound attractive. Enlistment bonuses are usually paid once initial training is complete (basic training and job training), upon arrival at the first duty station. Some of the services pay the entire bonus in one lump sum, while other services pay a portion of the enlistment bonus upon arrival at the first duty station, and the remainder of the bonus in periodic payments. If a recruit fails to complete their entire contracted enlistment period in the job they agreed to, they must return any "unearned" portion of the bonus in most cases. For example, if a recruit enlists in a specific job for four years with an enlistment bonus of $8,000 and becomes medically unqualified for the job after the first two years, he/she would have to return half of the bonus amount for the second two years. Re-enlistment bonuses, on the other hand, are used to entice troops to re-enlist in a job that the military is experiencing shortages in. Generally, this is because the job is difficult or otherwise unattractive or the job is in high demand in the civilian job market. Re-enlistment bonuses are computed by "multipliers" assigned to specific jobs in "re-enlistment zones." For example, Zone A is for those with less than six years of service. If a job has a re-enlistment bonus multiplier of 3 for Zone A, that means those re-enlisting with less than six years of service would multiply their base pay by 3, then multiply that by the number of years they are re-enlisting for, and that would be their re-enlistment bonus amount. 50 percent of the re-enlistment bonus is usually paid at the time of re-enlistment, with the remainder paid in equal annual installments for the remainder of the enlistment period. As with enlistment bonuses, if the member fails to stay in that job for the entire re-enlistment period, they must repay any "unearned" portion of the bonus they already received. Both enlistment bonuses and re-enlistment bonuses are taxable income with one exception. If you re-enlist in a combat zone and qualify for a re-enlistment bonus, the entire bonus amount is tax exempt.